Spring is a busy time for sports fans. There’s the end of March Madness, the start of the MLB season, the NBA and NHL playoff races, and the NFL draft. Luckily, iPhone and iPod touch owners can choose from a bevy of apps to stay on top of that action. Not so luckily, Fox Sports Mobile, while useful for checking the latest headlines, is not without its minor frustrations. Give Me a (Paragraph) Break: News stories on Fox Sports Mobile don’t offer a lot of formatting. Built by Fox Sports Interactive, this app is available for free, though ad-supported. The rather unobtrusive ads appear as a small bar at the bottom of the screen, just above the menu bar. The ads are present on most screens, although their absence on box score screens is welcome. 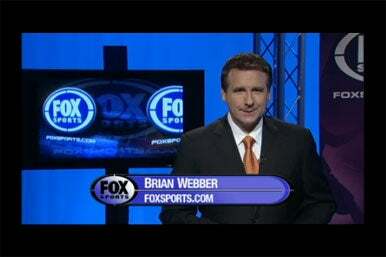 Fox Sports Mobile features a no-frills, black text on white background look. Some stories include small photos, but you can’t make them any larger or zoom in on them. Notably absent is a way to share stories with others: you can’t tap on a button to e-mail stories or tweet them. In a world increasingly dominated by social networking, this is a particularly puzzling omission. The app’s box scores provide all the requisite information, although they do so in frustrating fashion. If I want to see how many points LeBron James scored last night, it takes three taps from the scores page to do so. Fox Sports Mobile splits up its box scores into team stats and player stats. To access player stats, I have to tap a button for team stats and then scroll to “Cleveland starters,” and tap it for the Cavaliers player stats to appear. This seems to be a lot of work just to find out that LeBron James scored 38 points the other night night. This is a usability issue and, admittedly, one which most fans might not notice, but when you want information quickly, the app’s layout can be somewhat frustrating. If you’re looking to read the latest roster reports or notes about your favorite team, the Fox Sports app essentially prevents you from doing so. The app doesn’t format stories properly—you won’t find breaks between paragraphs or lists. The end result is a complete mess, with stories and roster reports that come out looking like huge blobs of text. 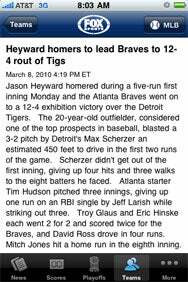 It’s also incredibly frustrating that the headlines and game recaps are all formatted correctly, but team-specific content is consistently a mess. Picture In Picture: Sometimes the video in Fox Sports Mobile fills the entire screen of your iPhone or iPod touch. This is not one of those times. Fox Sports Mobile includes video, but the options are limited, and the video sometimes does not fill the screen as it should. Sometimes, the video would fill the screen in the same way that the iPhone’s YouTube app displays video; other times, it wouldn’t. It may seem harsh to pan an app that doesn’t cost a dime. But Fox Sports is a major media outlet, and a company of that stature shouldn’t put out an unfinished product, free or not. With some minor tweaks, the Fox Sports Mobile app could be an All-Star app, but for now, it’s just an average and frustrating option in an already-crowded field.